 Sunset Rock - Atlanta Rocks! From Atlanta, take I-75 North to I-24 West, towards downtown Chattanooga. Take exit #178 (Lookout Mountain/Market Street). Go through the next two stop streets to Broad Street. Turn left (south) on Broad Street. Proceed through several lights and then under the railroad overpass. Broad Street becomes Highway 41. Continue for a mile and take the ramp on the left, marked with signs for Ruby Falls. This the South Scenic Highway (Hwy.148), which winds it’s way up Lookout Mountain. At the crest, continue through a flashing light, for about mile to a fork in the road. Bear right onto West Brow Road. The parking lot for Sunset Rock is on the left after about a mile. Note: Parking is extremely limited and is strictly enforced. If the lot is full, continue to the Point Park ranger station, which has additional parking for about ten cars. From Knoxville, take I-75 South to I-24 West. Follow the same directions as above. From Nashville, take exit #174 (Tiftonia) Turn right onto Cummings Highway. Follow signs directing you up Lookout Mountain, to an intersection with South Scenic Highway. Turn right, go up the mountain and follow the aforementioned directions. Additional parking for Sunset has been provided by the Chattanooga Nature Center, at the foot of the mountain. From I-24, take the Browns Ferry Road exit to Cummings Highway. Follow signs for the Nature Center and park in a gravel parking lot just before entering the Center. The hike up is roughly 2 miles to the base of Sunset Rock.